Supernet has won Brand of the Year Award for year 2009, in “Data Network Operator” category, in a ceremony held recently. 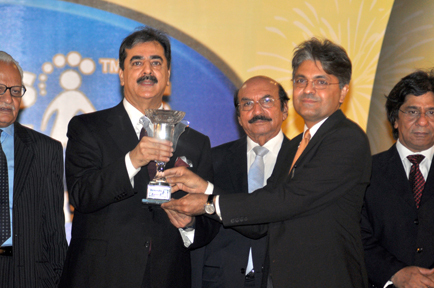 Mr. Imran Malik, CEO Supernet of Supernet recieved the award from The Prime Minister of Pakistan His Excellency Yousuf Raza Gilani. Supernet is offering corporate data services since 1994. Supernet offers a full portfolio of local-to-global integrated communications infrastructure solutions to facilitate the key business processes of corporate, SME and individual customers. ^Supernet was one of the first providers of internet (dial up) in Pakistan. That was a time when not many Pakistani’s were on the web! This a pay as you go award. Completely meaningless. The only and only reliable dial up for me in my area. Minimum disconnections even my line has so much noise that ptcl, cybernet and WOl failed to connect for even 30 mints but at that time Supernet connects for 2 to 3 hours for me.